These measuring tools from OXO are an essential for every kitchen. 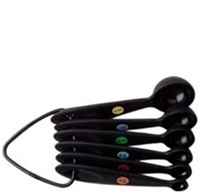 Our Measuring Spoons feature brightly colored numbers so measurement markings are easily recognizable. The Spoon handles have soft grips for added comfort. Constructed of sturdy plastic, the Spoons make dipping into flour and sugar a breeze. 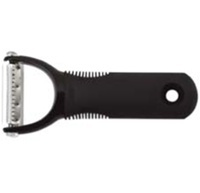 The OXO GOOD GRIPS Nylon Round Turner has a broad surface that is perfect for flipping pancakes and hamburgers. 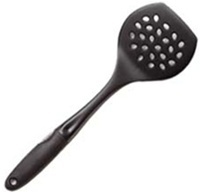 This nylon tool is safe for non-stick cookware, and is heat resistant up to 250 degrees F.
Try the OXO GOOD GRIPS Nylon Spoon for stirring sauces, pasta, and more. Nylon makes this tool safe for non-stick cookware as well as heat resistant up to 250 degrees F.
Create culinary sensations with the OXO Good Grips Julienne Peeler. With OXO's Julienne Peeler you can quickly and safely make garnishes, salad toppings, Asian dishes, citrus zest and more. Apply the sharp, stainless steel blade to firm fruits and vegetables such as zucchini, carrots, potatoes, apples or citrus fruit. When you begin to peel the fruit or vegetable, perfect julienne strips are cut. The soft, non-slip handle is contoured to accommodate both a regular and a choked-up grip for more control. The clear safety cover flips out of the way while you peel, but locks back into place as a protective cover during storage. Slicing pizza is easy with our sharp, stainless steel Pizza Wheel. A thumb guard keeps fingers away from the blade for added safety, and a soft handle absorbs pressure while you slice up your favorite pizza. Try using our Pizza Wheel to cut strips of dough for a lattice-topped pie! Core and slice apples and pears with ease with the OXO GOOD GRIPS Apple Divider. Soft, wide handles take the pressure off your hands, and sharp, stainless steel blades glide easily through fruit and yield perfect slices. The handles are raised to assure ample clearance between your hands and the table. The OXO GOOD GRIPS Apple Divider is perfect for pies, cobbler, or preparing a simple snack. Working through a bushel of oysters is easy with the OXO GOOD GRIPS Oyster Knife. Its soft handle is shaped to nestle comfortably in your hand, and won’t slip as the sturdy, stainless steel blade with bent tip penetrates and pries open even the toughest shells. Our Potato Masher features a sturdy stainless steel wire head and a cushioned handle that absorbs pressure while you mash. This tool is not just for potatoes! Try mashing yams, carrots, or other root vegetables, or make homemade baby food by mashing apples or bananas. The GOOD GRIPS 11” Whisk is made of highly polished, sturdy stainless steel wire. The unique teardrop handle design fits comfortably in your hand, and absorbs pressure as you perform a multitude of tasks. These measuring tools from OXO are an essential for every kitchen. Our Measuring Cups feature brightly colored numbers so measurement markings are easily recognizable. The Cup handles have soft grips for added comfort. 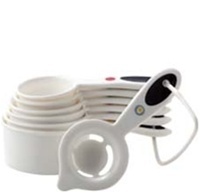 Constructed of sturdy plastic, the Cups make dipping into flour and sugar a breeze. The Cup Set also includes an Egg Separator. This Turner from our Stainless-Steel collection is the perfect tool for flipping pancakes, hamburgers, and more. Stainless-steel construction makes this Turner strong and durable, and it features a soft, comfortable handle.